Previously a home-owner might have to purchase various systems to protect their home from fire, break-ins or to control lighting, curtain, air-conditioning, heating, ventilation etc. But with the MoMas™ Honeywell Standalone Smart Home Solution HRIS-1000 Series, the functions that protect the home and its assets are now seamlessly integrated into one single system. This Smart Home system provides occupants peace of mind and comfortable living, as well as to save energy costs. The interface is very user-friendly and can be controlled wired or wirelessly via the telephone, Internet, mobile or through a WiFi device. MoMas™ Honeywell Standalone Smart Home System HRIS-1000 brings you safety, comfort, convenience and infinite possibility of a premium life. On the same system are controls for lighting, temperature (air conditioner and under floor heating control), electronic curtains, air purifying and more. In addition, home-owners can choose from pre-set scenarios to control the environment and ambience settings in their homes. For example, setting different room temperatures and/or lighting for different time in the day or for different activities. Alternatively, home-owners can customize and store up to 64 scenario settings to create the comfort they desire in their homes for a day, a week, a month or even a season. The system also features a user-friendly interface and can be wired or wireless control via the telephone, Internet, mobile or through a WiFi device. We are building a world that is safer, more secure, comfortable and energy efficient. We are Honeywell. 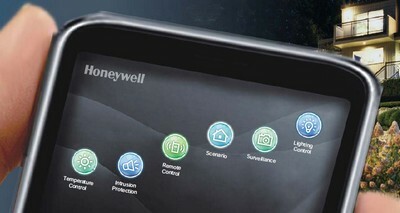 Honeywell is an advocate of energy efficiency, and Honeywell Stand-alone Smart Home System brings you a green home. The Honeywell Standalone Smart Home System HRIS-1000 is specially designed with an energy-saving detector to help save energy use. If the detector has detected that a particular area in the house has not been visited for a while, the system would automatically switch off the lights or the air conditioner or lower the heating to save energy.